Physical characteristics: Coppersmith barbets are small, plump barbets with a short neck, large head, and short tail. They have dark green upperparts, a red forehead, yellow sides of the throat and head, one black stripe through the eyes and another one that runs below the eyes and onto the bill. They have pale greenish-white under parts with broad dark green streaks and a red patch across the upper breast, and reddish legs. Females are a duller red than the bright males. Juveniles lack all red colorings, with streaky patterns on the throat and a much paler bill. Adults are 5.9 to 6.7 inches (15 to 17 centimeters) long and weigh between 1.1 and 1.8 ounces (30 and 52 grams). 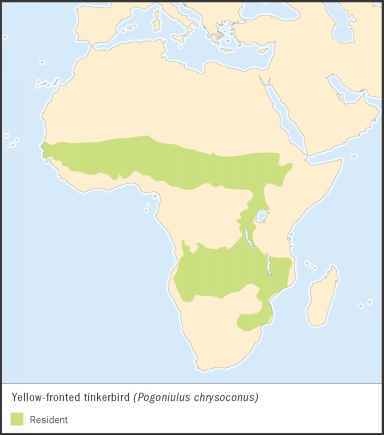 Geographic range: Coppersmith barbets are found from peninsular and northern India, northeastern Pakistan, Bangladesh, Nepal, and Sri Lanka, to southwestern China, Malaysia, Sumatra, and the Philippines. Habitat: Coppersmith barbets prefer dry deciduous woodlands, forest edges, teak forests, irrigated orchards and plantations with fruiting trees, urban areas that contain trees, and mangroves. Diet: Their diet consists of figs, custard-apples, guavas, mangos, and papal fruits, along with smaller berries and many types of insects such as beetles, crickets, mantids (plural of mantis; large, predatory insects), and various insect larvae. They tap and chip away tree bark in order to find invertebrates (animals without a backbone). Behavior and reproduction: Coppersmith barbets sing frequently with a long call. While singing, they bob their head, jerk their body, and flick their tail. 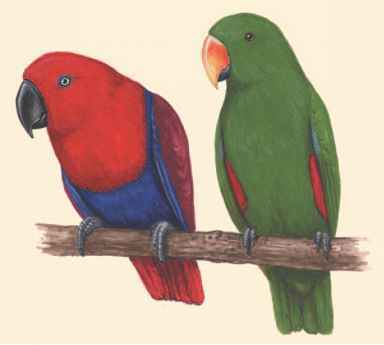 Their call is a series of "tuk-tuk-tuk," which sounds like a copper sheet being beaten (which gives the bird its name). Females lay two to four eggs in a hole dug from a tree. The incubation period is twelve to fourteen days, and the fledgling period (time for young to grow feathers necessary to fly) is about five weeks. Both parents feed the young, but once chicks learn to fly the parents leave them to brood again (young born and raised together). Coppersmith barbets and people: People often enjoy hearing coppersmith barbets sing their "hammering" song.